A Sustainable Witch Costume — KEEPER & CO. I can sense the cozy holiday season approaching in the Pacific Northwest as the large rain drops pelt my window and make me thankful for their rhythmic music and the warmth of my home. The anticipation that Fall brings is exciting with festive celebrations just around the corner... the first being Halloween! Since starting on this journey about two years ago of taking the Earth into consideration in my daily life, the holidays have given me an uneasy feeling as we buy even more unnecessary items than we do the rest of the year. For Halloween costumes, we generally don't want to spend a lot on something that we'll only wear once, so we buy the cheapest option, usually made oversees by people who are highly underpaid. The poorly made outfits are then shipped around the world, wasting precious natural resources for a Halloween costume. I enjoy celebrating the holidays, but it's not worth trashing the Earth and exploiting people for. If I need to dress up I'll either make a costume out of found materials or rent one. This one was easy for me because my wardrobe mainly consists of long, black layers. I wore a simple black dress and a long sheer cloak. If you need extra pieces I recommend buying them from a thrift shop or consignment store near you or online at Thred Up, Swap or Etsy. Either use your jewelry you have or buy used but stick with the pieces that have natural stones like agate, citrine, amethyst, or other crystals. The necklace I used was a geometric piece with an agate sphere and I wore an amethyst ring. I used the black boots that I had which are a staple of mine for winter, but you could use any dark shoes really that you have or buy them used. I just used the black floppy hat that I had, but most felted hats with brims could work. Use your own, borrow someone's or buy it second hand. It doesn't matter if it has a band around it as it will just get covered. You'll need a piece of black felt about two feet by two feet depending on the height of wizard hat you want. I bought mine from a local thrift store for about a dollar, but you can also buy felt made out 100% recycled materials and made in the USA. You can either collect some living moss or lichen from outside, or you can buy it dried. I just plucked some lichen off a tree in a nearby park and then used some dried moss which you can buy from a local Etsy shop. A mixture of two different kinds looks the most natural. If you want to add an extra little forest wizard feeling, you can collect a feather or two if you find them when looking for moss or you can get some humanely gathered ones on Etsy. I used scraps of black and brown string that I saved from presents and projects but you can buy 100% natural and biodegradable twine, made in the USA from Divine Twine or a maker in your area. You just need a thick stick that is at least the height of the person you're making the costume for. I don't have trees that I prune, so I took one of my neighbors' clippings off their hands. If you want to go on an adventure in a park or the forest to find a fallen branch that could be fun too! Just let it dry inside for a day before using it if it's wet and give it a little dusting. I already had a few vintage citrine clusters so I just used one of those but you can buy vintage amethyst, quartz, or citrine at a local antique store or on Etsy Vintage. I used biodegradable tape made in Colorado by Eco-Enclose. This tape is worth buying a roll of because it works great for wrapping presents and packaging boxes after costume making. 1. To make the wizard hat, take the felt hat and form a cone shape around the crown with the scrap piece of felt and pin the seam so that it stays together. 2. Trim the bottom of the cone if necessary so that it sits upright on the hat. 3. Sew the seam of the cone from the top to the base with a basic stitch and when you get to the end, give the string a slight pull so that the hat curves a bit (you don't have to do this, but I like how it makes the hat look more natural). When you get the curve you want, tie it off. 4. To attach the cone (top of the hat) to the felt hat (the base), just place it over the crown of the hat and and wrap some of the string (I used a tan color) around the crown one or two times. On the last wrap, tuck a small piece of moss or a feather under the string and then tie the two ends of the string together in a knot. The top of the hat will be secure enough but won't ruin the felt hat for later use. If you want you can pin the the cone on the hat but it's not needed. 1. To make the magical scepter hold the stick up to the future wizard and mark their height on it, if it isn't their exact height already. If it's too thick to break by hand, use a knife or box cutter to score all the way around it on the mark and then step on the score to break the top off. I don't use a saw because I like the natural and rustic look of the broken top. 3. Find the place where the stick will be held by the wizard most the time (usually their elbow height) and roughly wrap about two feet of string (I used black) around that area so that it makes about a five inch high section on the stick. Tie it off in a knot and trim the ends to about a half inch long. This will act as sort of a grip and add handmade detail. 4. 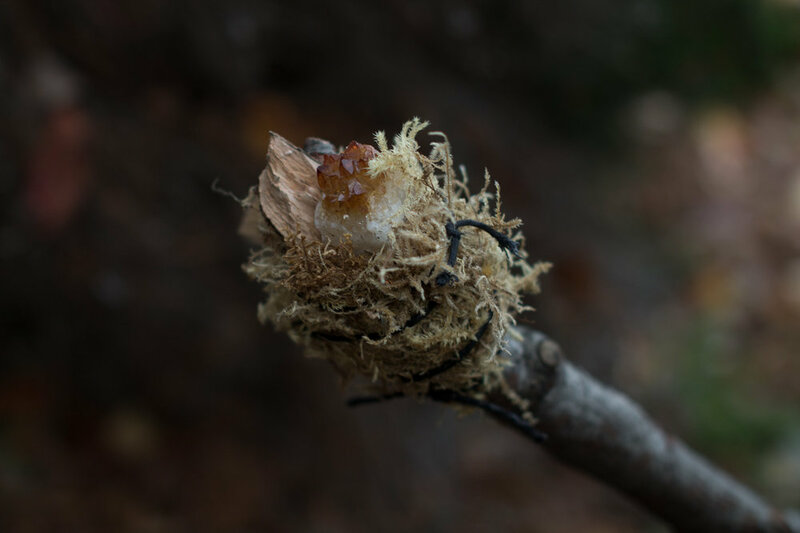 To make the top, hold the geode or cluster alongside the tip of the stick with the most interesting part facing up (when the stick is help upright). Secure the crystal by wrapping a piece of the biodegradable tape around the stick enough of the geode to secure it. 5. Pack about a handful of moss around the geode to cover the tape, but leave the top of the crystal peeking out. It should almost look like a cone-shaped moss nest with the geode being an egg inside. 6. Once you have the formation and amount of moss you want, wrap some string around it, starting at the base of your "nest" and working your way up to about three quarters the way up and then tie the two lose ends together in a knot. Cut the ends to about a half of an inch long. I tucked a small feather in the string opposite my citrine cluster to add balance. 7. If you want, you can add another four-inch-or-so section of twine wrapped around the stick near the bottom. It adds a nice touch of texture that balances out all that is happening on the top of your scepter. The success of this disguise might have been measured by the man who stopped us in the middle of this photoshoot to sincerely ask if I was performing some kind of ritual. Too real maybe? I hope you have a lovely holiday, whatever character you decide to be.. even if it's just yourself!